This article is from Matt Neputin, from Creepy Stories. Chip ‘n Dale Rescue Rangers 2 for the NES was my favorite childhood game. And interestingly it was my favorite even though I didn’t understand it at all. Why you might ask? Because it was in Chinese. My mother bought me a chinese bootleg of this game for half a dollar. But to be honest, there’s not much plot to this game to begin with so I don’t think I lost out on much. The real meat, the real pleasure was saved – the gameplay. I still reminisce about the good old days when I would spend two hours playing this game, reaching the next-to-last level and then dying, only to have to begin from the beginning. It’s a very fond memory for me because back then I didn’t mind it at all. I considered it just a training in persistence. I think that nowadays games make it just to easy for players to play them. But I digress. This game was made in a time in which the fact that a game was based on a movie or a television show did not decrease it’s chances of becoming a great game. This might be partially because at that time capcom liked to do these sorts of games. And I have to say that I have heard that the first game in this series was actually better, but at the time I only could afford one game, and so I can’t express my opinion about the other game. But I personally feel that the other reviews of this game judge it on the basis of it’s prequel and so omit the fact that this is an amazing game in of it’s own. The game is a very enjoyable platformer in which you can pickup objects and throw them at your enemies, and in each area there’s a boss you have to defeat. The standard stuff. 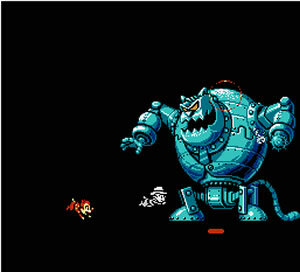 But only problem that was annoying me in this game as a kid is that there are not many characters from the actual TV shows as bosses, the bosses in this game are more often than not completely different villains than the villains we got to know through the animated tv series, and since as a child I loved the TV series to bits, that really annoyed me. 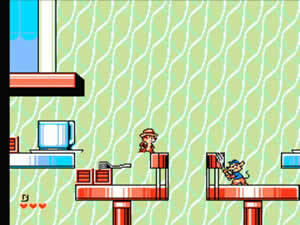 Another actual problem with this game and in all NES games in general is that you simply couldn’t save between levels. When I was a kid I very often cried because my rodent died in the final boss battle and I had to play the game from the very beginning which got annoying after a while, but ultimately thought me the value of persistence. In summary if you’re a fan of this classic animated television show, I would really recommend you to pick up this game and play. It’s one of the most entertaining platform games I ever played, and I have played many since then. And I am sure that the prequel (which generally gets even better reviews) is just as good if not better. Matt Neputin spend the entirety of his seventh year on this planet on only playing this game so he knows what he’s talking about.